The Voice Search application for Android just went personal. Actually, a new update is available and includes what “Personalized Recognition” that if enabled, over time, will learn from your voice to help make your searches more accurate. Who didn’t want a custom speech model for X-mas? If you opt into personalized recognition, we begin to associate the recordings of the words that you ask us to recognize with your Google account. We then automatically use these words to build a speech model specifically for you. This speech model enables us to deliver greater recognition accuracy. Although subtle, accuracy improvements begin fairly quickly and will build over time. 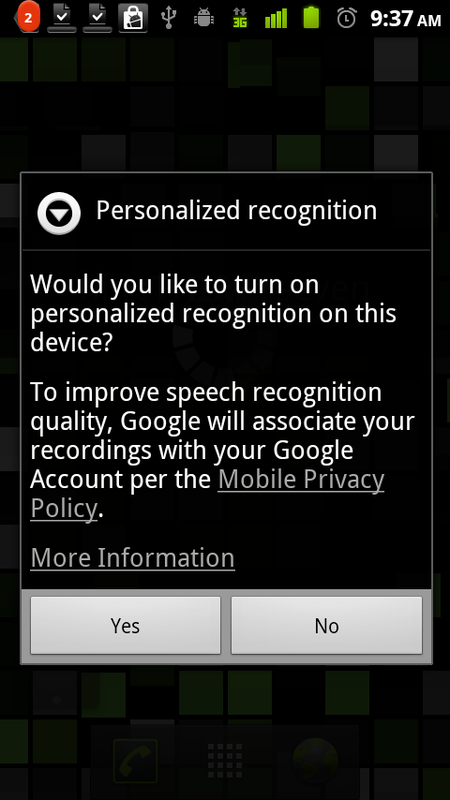 For Android 2.2 phones and above, and you’ll have to click yes when prompted to begin building your speech empire.